RAL (or Reichsausschuss für Lieferbedingungen und Gütesicherung) codes were a way of standardising the paint shades used by the German government. The system was introduced in 1927 and each colour was identified with a numerical code. From 1941 onwards this had four digits. The colours were created using materials available in Germany, and as they used natural earth pigments they would not oxidise or fade. As a result wartime colour samples are still useable references. 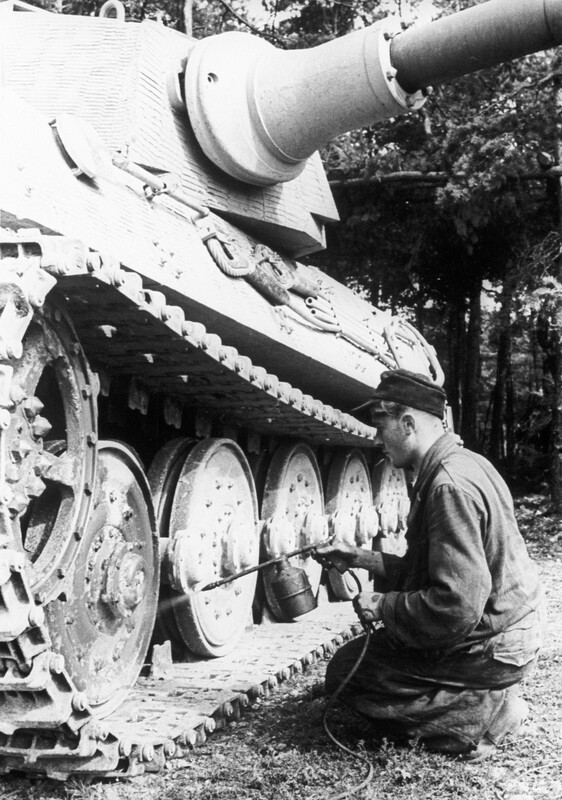 In 1944, when the Tiger II and Jagdtiger were built, German tanks were painted in Dunkelgelb at the factory. Frontline units were issued with tins of RAL 6003 (Olive Green) and RAL 8017 (Red Brown) paint in the form of concentrated paste. They would thin this with water or petrol and paint over the Dunkelgelb themselves, creating a three colour pattern. This meant that while the colours on German armoured vehicles were standardised the camouflage pattern was not. It is sometimes assumed that units would use any available paint, so German tanks could have been painted in a range of different colours. This did happen, especially whitewashing in snowy conditions, but the German system and mentality frowned upon this sort of improvisation, so it is unlikely to have been widespread. It’s also worth remembering that in isolated areas of Russia, Europe or North Africa what was issued usually was the only available paint. The Museum’s Tiger II and Jagdtiger both spent the war with trials units at Sennelager Training Area. As they were never used by a frontline unit their Dunkelgelb was never painted over. Museum staff used documents from our Archive and original paint samples on objects in the collection to determine the correct shade for the two vehicles. This was then recreated by Colour Right Paints Ltd of Bere Regis. One of the aims of the Tiger Collection is to highlight the differences between the legend and the reality of the Tiger tank. The Tiger II and Jagdtiger’s previous colour schemes were applied decades ago based on information we now know was inaccurate. Repainted, their new colour may seem less interesting, but it reflects the true history of both vehicles. See the new colour schemes in person at The Tiger Collection. 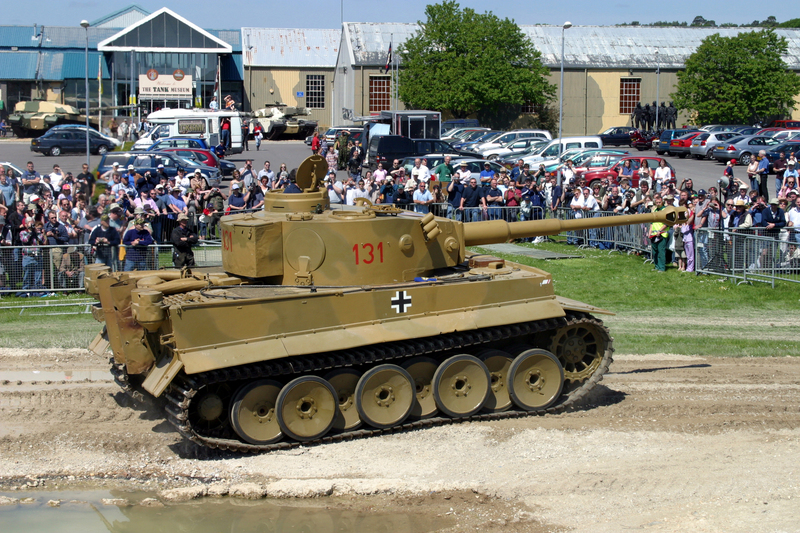 Find out more about the Jagdtiger and the pre-production Tiger II. I wonder why, at the end of the war, when they were hurting for weapons of any kind, they were still at a trial facility? 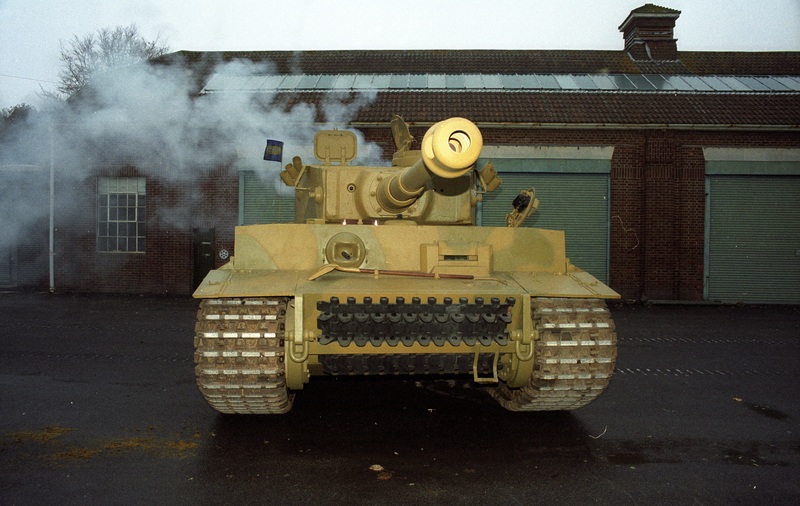 Whilst I understand the rationale for leaving the vehicles plain Dk Yellow, part of the fascination(for me) of the German armour was the infinitely variable camouflage that cold be achieved using the 3-colour method they had. I believe it would have been better to find a well known archival image of each vehicle, and replicate the camouflage pattern of the period photo, along with a write-up of the vehicle being replicated, it’s combat history, crew details etc depending on what is available. This would make for a far more interesting, and stimulating exhibit. The Jagdtiger looks much better, but I’m not sure about the Tiger II. I think it looked better in 3 colour camo. Accuracy is,of course,to be applauded. But they look far less interesting now & where indeed are the markings? From the original photographs, it seems the Jagdtiger had “Balkenkreuze” on the upper sides, which the current paintjob on it does not have. I understand the desire to be historically accurate, but those color schemes are incredibly uninspiring. I feel like the Tigers should be presented in all their glory, not as stripped down lowly prototype vehicles. Part of the allure of the Tigers is the intimidating impression or “Tiger Shock” they project, and I just don’t get that feeling looking at these proving ground examples. Pick a combat paint scheme and use it. 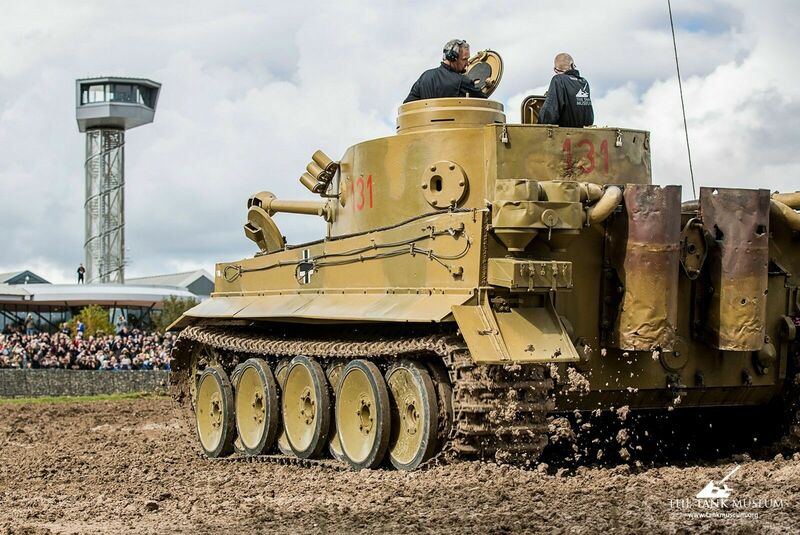 People want to see the tigers as they would have been seen on the battlefield, not frozen in time in a boring trial period paint. That paint job looks not great and where are the markings? 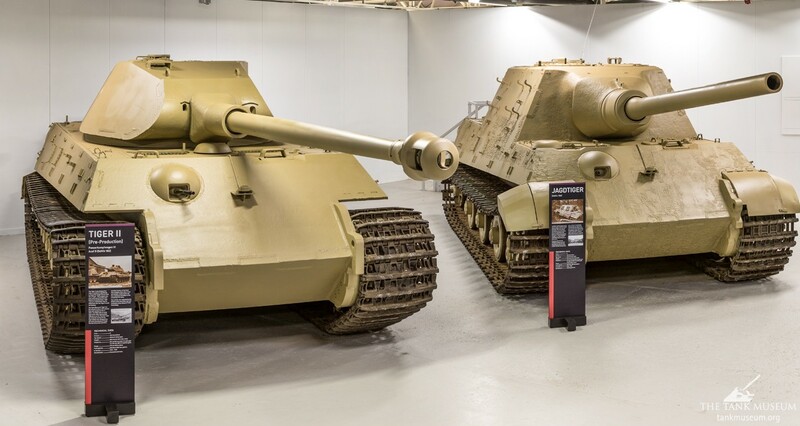 I prefer authenticity and accuracy above all else in our sources of history, and in repainting the Jagdtiger and Tiger B in the Dunkel Gelb colour that they were captured in, further enhances the attention to detail that the Tank Museum excels in. Their more modest background as training vehicles and lack of rotbraun and oliv grun takes nothing away from them. They are coloured by reality, not a colour scheme applied at a front they never went to. 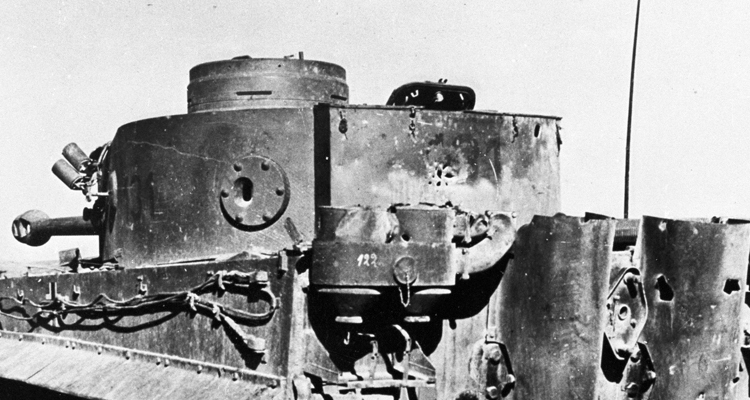 The Tiger Exhibition is after all ‘ The tanks, the terror, the truth’, and against this can be set the more battle scarred histories of Tiger 131, Tiger B 104, and Tiger (P) Ferdinand/ Elefant 102. 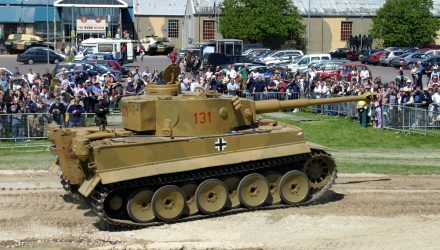 P.S How about a Dvd about the Tiger Collection, showing the exhibition being set up, the journey of the Elefant from Stateside, Tiger 131, and the excellent ‘ Tank Chat’ Blogs?